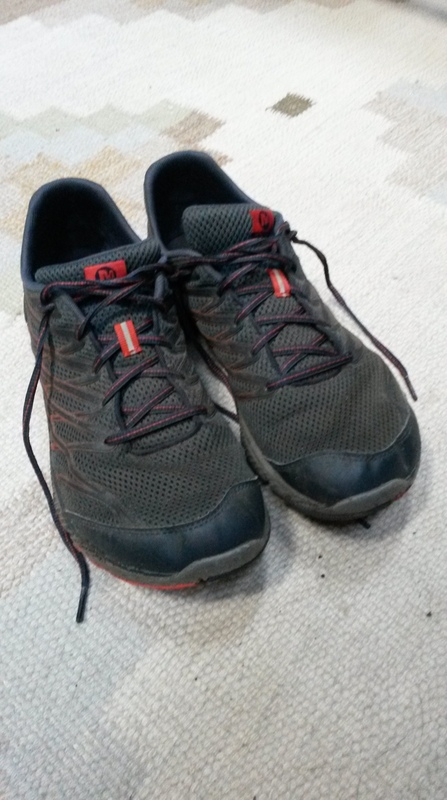 Gear review, trail runners and the Talon 44. You may have noticed some of the pictures I’ve posted. At least I hope you have. Most are not from places you can easily drive to. 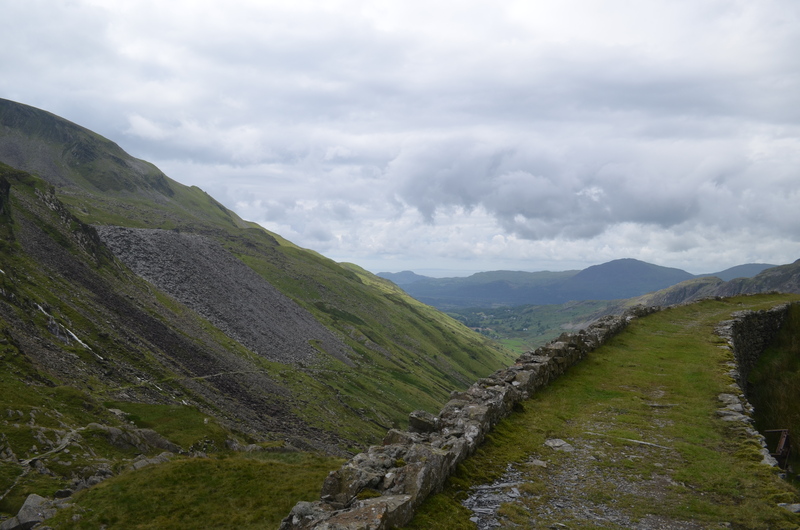 The road on this Welsh mountain isn’t for cars. Not even those little tiny ones they drive too fast and on the other side of the road in the UK. 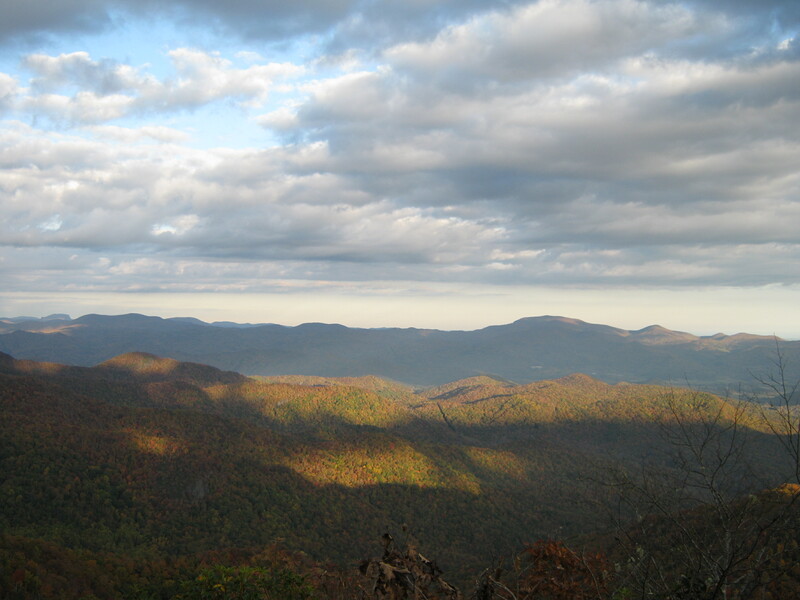 This view, on the AT in North Carolina, isn’t on the road either. So I tend to walk. Which means I wear shoes. I used to wear hiking boots. These are Merrell bare access 4 trail runners. Ones that happen to be used and peat-stained. It doesn’t look quite as pretty as the catalog image. I’ll typically wear only a thin pair of liner socks. There are two approaches to keeping dry feet. Do and don’t. In reasonable 3-season hiking the best approach is to let your feet get wet and then wear gear that dries quickly. These are laced with a “heel lock” which holds them on tightly without requiring extraordinarily tight lacing. It also means that the backs of the shoes don’t wear out and break down. Most trail runners wear out quickly, so I only wear these for walking. They have a thin vibram sole. Mine don’t slip when they’re wet, which is good. Not just good but necessary. The thin sole is a blessing and a curse. You can feel your way, it’s almost barefoot. It also means you can feel sharp rocks and gravel. After a good few kilometres, I strongly recommend them. I also need a pack. My trusty REI flash 50 finally bit the dust after several years of hard service. 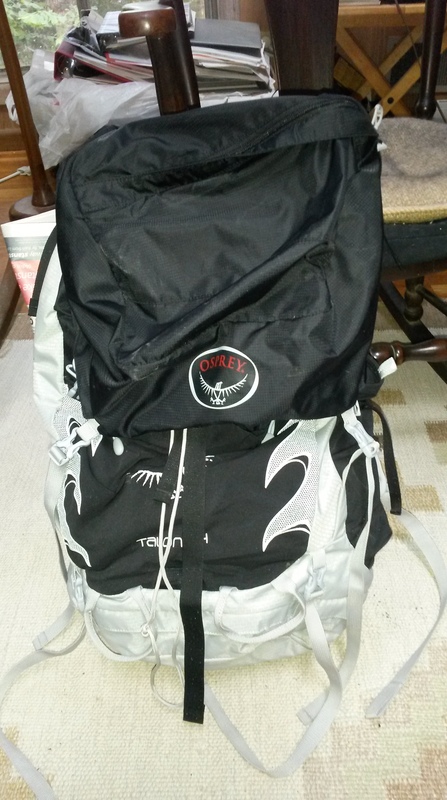 I thought very hard about replacing it with a Gossamer gear or similar ultralight pack. (I have and love a Mariposa plus.) Several things made me choose the Osprey Talon 44. It’s made of tougher fabric, it has a top pocket with a key holder, it easily meets airline carry on restrictions, there’s a semi-hidden pocket for passports and spare cash, and finally it carries a reasonable amount of weight without too much effort. This last point is important. I tried an earlier version of Osprey’s breathable frame and it hurt. (This is a personal observation, my son used it for Philmont without any trouble.) Finding where to put water bottles and platypus’s (platypi?) is a little problematic but solvable. There’s even a top strap under the lid so I can drape my raingear over the top and strap it in. It’s definitely big enough for a light-weight backpacker during the three easy seasons. I always add a couple of extras to my packs. 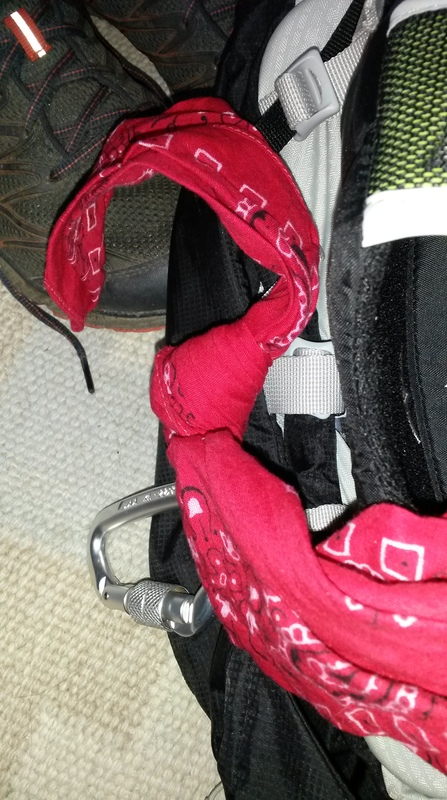 A real carabiner – from the climbing section at REI and not a cheap knock off, is essential. I clip my walking sticks and map case to it. It can also double as a pulley when I hoist my pack in bear country. This carabiner is a locking one which is better for my use than a clip one because it won’t accidentally clip on to things. The other thing is a bandana. Cotton might kill, but a bandana is a life-saver. A pot holder, an emergency hat, when soaked in water it can keep you cool, and um, is useful for washing those delicate areas when they start to chafe. I also tie it to the pack I’m using as sort of a badge of honour.